July 2nd – 7th, 2019! WHAT ARE THE WORLD SPORTS GAMES? An international event with thousands of participants that takes place every two years in a different city. 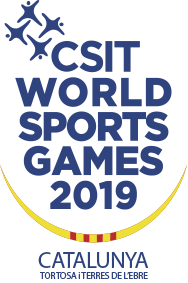 Tortosa and Terres de l’Ebre will host the 2019 WSG edition. An international sports week combined with touristic and cultural content. An international event created for amateur athletes. Young people, old men, women from different countries and cultures. Everybody can join the WSG! A sport competition based on the idea of the International Workers’ Olympiad of the 1920s/30s celebrated in an environment of tolerance, respect and sustainability. A festival that brings together sports friend from all over the world. A great opportunity to show the cultural heritage of Tortosa and Terres de l’Ebre to the world and a perfect platform for the economic promotion of our territory. The Union of Sports Councils of Catalonia is a non-profit sports association, created in 1994, as a body that unifies, coordinates and uniquely represents all sports councils in Catalonia. The most relevant functions of the UCEC, are: To organize by delegation and in agreement with the Catalan Council of Sport of the Generalitat de Catalunya, activities of competition of this one organism and others of their own. Guarantee at all times that sports and recreational activities, practiced mainly at school age, are carried out with criteria that benefit the integral training and health of all citizens. Promote and manage sports facilities and complementary services that facilitate and enhance sports practice.